My wife considers herself a bit of a cook. Perhaps not gourmet chef standard, but certainly capable of feeding the local football team. For many years she has complained bitterly that her kitchen knives were continually blunt. We had a knife sharpening steel with one of our knife sets, but while it could hone a sharp edge, it had no hope of reviving a very blunt knife. I also had a Norton Sharpening Stone, but while it was okay for garden tools, could not achieve the keen edge required for a kitchen knife. I trawled the internet for knife sharpening systems, including finer sharpening stones, hand operated kitchen knife sharpening tools, multifunction knife sharpener tools, belt grinders and even using ultra fine wet and dry sandpaper. I required a knife sharpening system that would sharpen very blunt knives to a keen edge. I did not want to spend hours sharpening our kitchen knives — knife sharpening is not a labour of love for me! I wanted something that I could quickly put a keen edge on a kitchen knife with minimal effort. With these requirements, I settled on the Razor Sharp Edgemaking System. I purchased the Razor Sharp Gritted and Slotted Paper Wheel 8” Kit & Accessories for $85 from Artesian Supplies in Australia. I had two bench grinder options readily available from my local Bunnings store. The $89 Ryobi 250 watt 150 mm (6″) bench grinder has an advertised maximum speed of 2,850 rpm, while the $29.98 Ozito 150 watt 150 mm (6″) bench grinder has a maximum speed of 2,950 rpm. 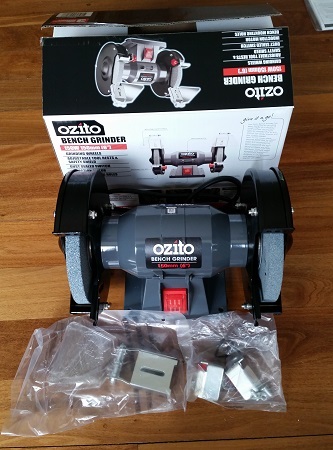 I chose the faster, cheaper, but less powerful Ozito bench grinder. I removed the guards and grinding wheels of the Ozito bench grinder. Six inch bench grinders are quite small, so I needed to make a spacer to lift the bench grinder sufficiently to allow the 8″ Razor Sharp gritted and slotted paper wheels to clear the bench. I bolted the grinder and spacer to a pine timber mounting plate. I have limited workshop space, so the mounting plate allows me to clamp the bench grinder to any available bench or table for sharpening knives, and then removing it when finished. I mounted the grinder so that it turns towards me, meaning that I hold knives with the edge downwards on the front of the wheels. I did this to ensure the on/off switch was readily accessible at the front of the machine. 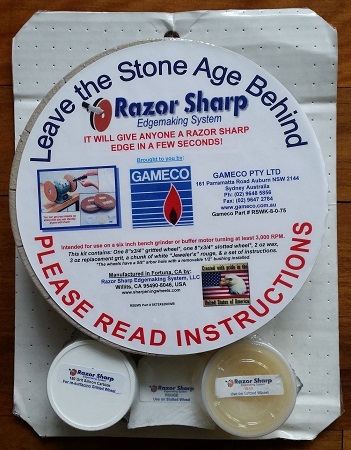 The Razor Sharp Edgemaking System is as good at the online reviews say. It is very easy to use and brings knives to a very sharp edge quickly. My kids laughed at me because I managed to shave off a large patch of hair on my forearm testing the knife edges. One drawback of the Ozito grinder, and I am sure many other small 6″ bench grinders, it that it has limited width between the grinding wheels. This means that when drawing a 20 cm cook’s knife across one sharpening wheel, it is possible to contact the other wheel with your hand. After grazing my knuckles a couple of times, I worked out that I needed to slightly lift the knife as I got towards the end of the stroke. Easy. 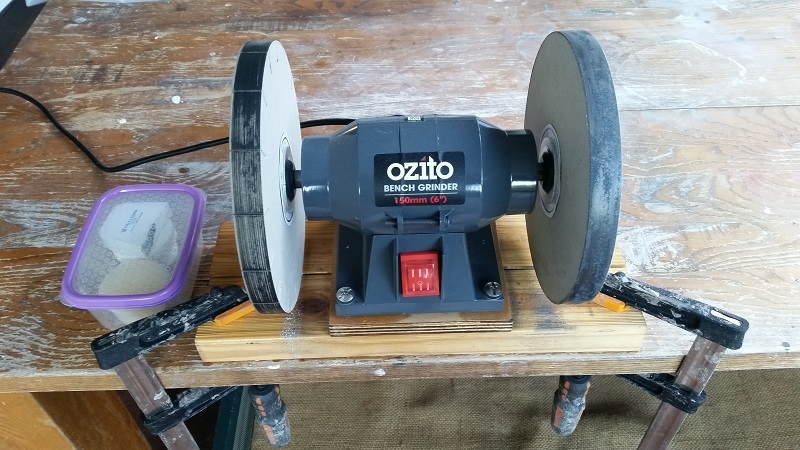 Overall, the Razor Sharp Edgemaking System fitted to the Ozito bench grinder is an excellent knife sharpening system for lazy people like myself. I can keep the kitchen knives sharp with minimal effort and at minimal cost — keeping my wife happy in the process!